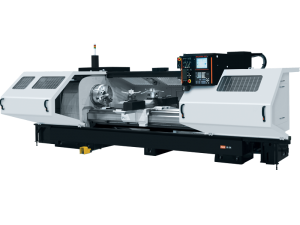 As some of Mazak’s biggest Turning Centers, the TURNING CENTER Series M-5 machines deliver heavy duty machining capability and feature flat-bed constructions for easy work access for processing big, heavy long parts. Plus, machines have big, hollow bore capacities for large diameter pipe-type work. The Mazak M-5N Turning Center delivers heavy duty machining capability and features a flat-bed construction for easy work access and chip flow. The dual turret configuration streamlines the processing of large, long parts. The M-5N also provides spindle bore sizes up to 7.1″ in diameter and with front and rear chucks, large diameter pipe-type work is easily handled. The Meehanite cast bed and base are of a single piece. The Meehanite-process cast iron bed has no cross ribs in the center to restrict chip flow (universal 1000). The double-wall box-type construction utilizes sand inside the casting for excellent damping characteristics. 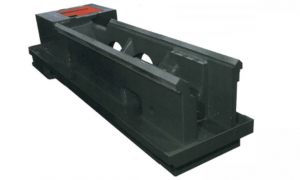 Combined with the rigid bed design, this ensures a stable foundation for heavy-duty cutting. The M-5N’s precision-ground V-shaped slideways undergo a special induction hardening process developed by Mazak (over Hs 70). Allow 14 permanently-set tools to minimize set-up time. High-precision, heavy-duty cutting is guaran­teed by large diameter couplings and high turret clamping force (front octagonal disk turret coupling: dia. 252 mm (9.92″), 4550 kg (10010 lbs); rear hexagonal boring turret coupling: dia. 230 mm (9.06″), 4100 kg (9020 lbs)). 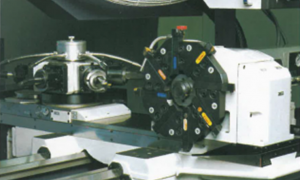 One-step turret indexing takes only 1.8 seconds, while full-step indexing takes 3.2 seconds, reducing non-cutting time (octagonal disk turret). The maintenance-free AC spindle motor, with a speed range 6 to 2200 rpm and full-power available between 178 to 2200 RPM by a 3-speed hydraulic gear shift system, makes the M-5N ideal for large-diameter workpieces of difficult to machine material. 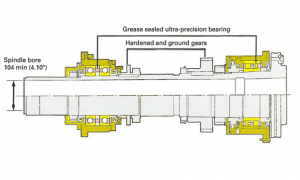 To eliminate noise and vibration, the spindle helical gears are precision ground after hardening. The forced oil shower lubrication system effectively prevents thermal displacement. The main spindle is supported by sturdy, ultra-high-precision double-row cylindrical roller bearings (spindle front bearing diameter: 150 mm (5.91″)) and angular contact bearings, providing the rigidity required for heavy-duty cutting. The large spindle bore of 104 mm (4.10″) makes the M-5N ideal for bar work.